I have been making rhubarb ketchup this summer using a recipe from The Moose Curry Experience. I love this recipe because the ingredients are simple and available, and it has that robust, tart flavour you cannot find in commercial brands, if commercial rhubarb ketchup were available that is. I decided to make a few changes to this recipe in order to use more of my garden produce, so I combined lovely red crabapples with the rhubarb. You can see that even the insides of the cut apple is red. Once I started with red, balsamic vinegar seemed appropriate both for the colour and flavour. The result was every bit as good as expected. I will probably alternate these recipes from now on. After all, you can’t have too many good rhubarb ketchup recipes. Place all ingredients in a saucepan, bring to a boil and simmer until the apples are very soft – about 1/2 hour. Strain through a food mill. If the mixture is too thin, return to the pan and cook down to the desired consistency. If too thick, add a little water and/or vinegar to taste. I recently wrote about making ginger soda, a simple process of fermenting ginger root until it bubbles (called a bug), mixing it with fruit syrups or juices and allowing it to ferment for a few days until a fizzy, sometimes downright frothy beverage is ready. These old- fashioned drinks have been a god send on these hot, sticky days of summer, but now I am ready for a change of flavours. Since a bug can be made from any edible root and since I prefer to use wild roots from my own backyard, I decided to make use of some of the vast quantity of chicory blooming not far from my kitchen window. Common chicory (cychorium intybus) is native to Europe but now naturalized in North America and Asia. It is a woody plant with blue flowers and cultivated for its leaves, buds, flowers and roots. At this time of year the pale blue flowers are visible along roadsides and in fields in this area. All parts are bitter tasting, although the flowers and leaves are popular in salads. Sometimes the leaves are boiled first to remove some of the bitterness and then added to cooked dishes. The root is the most commonly used part of the plant, usually roasted and ground to be used as a coffee substitute, caffeine free and less expensive than coffee. It is also used as a food additive in all sorts of things because of its inulin content. A word of caution: if you are allergic to ragweed pollen or any related plants, you might have a similar allergic reaction to this one. On the plus side, it does contain antioxidants, inulin and it is considered to provide functional help for the liver. To prepare the bug, I followed the same procedure as for my ginger bug. Beginning with about 1 cup of water, I added 2 Tbsp of chopped root and 2 Tbsp sugar. Cover it loosely to prevent any contamination. Each day I added 1 tsp each of root and sugar until it became bubbly. This took about five days. At this time, you can put a lid on it and refrigerate for a few days until ready to use. Once you use some of the liquid, replace the liquid with water and continue to feed more root and sugar a tsp a day. At this point, it has a pleasantly bitter taste which I thought very much like tonic water. For the first drink, I used the juice of one lime, 6 oz of water and enough honey to sweeten plus a bit more, since some of the sugar gets used up in the fermentation process. I then added 2 oz of bug, closed the flip lid to seal well and left it for five days. The second drink was made with elderflower cordial I had stored in the freezer – the same quantities of drink and bug and the same amount of time. The lime drink was quite dry and had a distinct bubbliness, much like a kvass. The elderflower was much sweeter and very frothy. It takes some practice to get the right amount of sweetness and fizz according to your taste, but I have not produced an inferior drink in any so far and they have all been far superior to any commercial soft drink. You can experiment also with any fruit flavours you like. The chicory adds a slightly bitter note which I like, but the flavour is neutral enough it does not overpower whatever flavour you are using. Categories: beverage, edible weeds | Tags: backyard foraging, beverage, chicory plants, ederflower, lime juice, root bugs | Permalink. The pods are filled with a tight wad of seeds attached to a fine, white, silky thread-like material which will be released and dispersed by the wind. However, when small (about 1-1 1/2 inches long) they are edible as long as they are boiled first for about three minutes, at which point they can be frozen for later use. The ones I used are pictured here with a 25 cent coin to give you an idea of the size. The flavour is sweet, a bit like a cross between okra and green pepper. I decided to roast them and make an Asian inspired dish with a spicy, sweet sauce. The sauce can be made in a few minutes and altered to suit the level of spiciness you are comfortable with. Served with noodles or rice, it makes a wonderful vegetable side dish or a complete vegan meal. Cook the pods in boiling water for three minutes, strain and cool under cold running water. Toss them in just enough oil to coat. Lay them on a baking sheet and roast in a 425 F oven for about 25 minutes, until lightly browned. Place the rest of the ingredients, except the sunflower seeds, in a saucepan and bring to a boil. Stir until all the sugar is dissolved, lower the heat and simmer for two minutes. Toast the sunflower seeds in a pan for a few minutes until they begin to brown. To serve, pour the sauce over the roasted buds and sprinkle with the sunflower seeds. 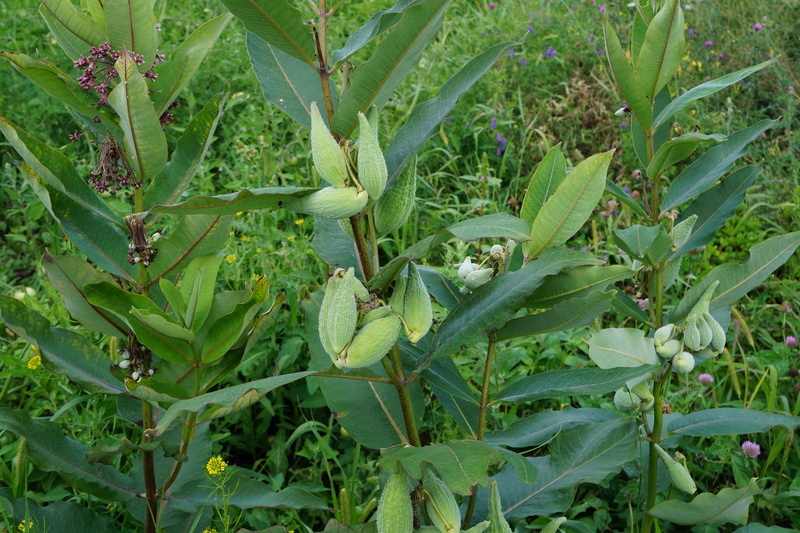 Categories: edible weeds | Tags: asclepias syriaca, gluten free, milkweed pods, vegan | Permalink.